I have been thinking about these brownies for ten years. Ten. That's since high school. I mean, I realize my dad teases me by saying that I've never forgotten a meal (which is true) but ten years is a long time to pine after brownies. My friend J's mom made them for me when I single-handedly got him into college. Okay, so in truth one component of his college application was a recommendation from a peer, which I wrote. And he got in. Thus, I got him in. Seems logical. And so I received a platter of these brownies. They are wonderful. J was in town the other week, and we met for lunch. I probably hadn't seen him for three years or so (I think we compromised on that number in the end). I asked him if he remembered these brownies, and not only did he remember them, he had the recipe. And he gave it to me, and now I'm giving it to you. They're actually quite beautiful, with that ribbon of green crème de menth running between the cakey base and the chocolate topping. These brownies got my friend into college. Imagine what they'll do for your holiday cookie platter. From J's Wonderful Mom. We're lucky I have such great friends. Preheat the oven to 350 F, and grease a 9x13" baking pan. Set aside. Cream the sugar and butter together, then add the vanilla. Add the beaten eggs, 1 cup of flour, and the chocolate syrup. Mix the batter well, and spread into the prepared pan. Bake for around 30 minutes, but check early. Allow the batter to cool completely while you make the next layers. Mix the butter with the powdered sugar and the crème de menthe. Spread it over the cooled brownie layer. Melt the chocolate chips together with the butter, either in the microwave or in a double boiler on the stove. Pour the chocolate layer over the crème de menthe layer. Transfer the baking pan into the freezer or refrigerator and allow to cool before you cut and serve. Wow. These are extremely good-looking brownies. We are lucky, indeed. Oh how pretty, I was this close to making these myself. Lovely job. These are delicious brownies! My family and I make them every year for Christmas the recipe is out of the Hershey's cook book! 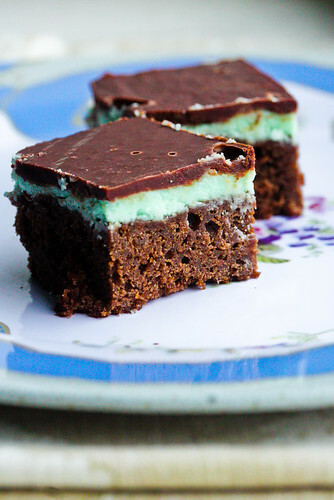 I have been craving mint brownies for a few months now. These look so yummy. Wow, these look amazing. Yum! NO, Chrissy, I want them! Hands off! these brownies look amazing!! i'm actually working on a batch right now, but the mint layer isn't mixing well. the butter is separating from the rest of it. the only thing i've changed is halving the recipe since i have a smaller pan. any tips?? Wayne, humm, the butter is separating? Was it room temperature when you started? It really only needs to be mixed enough so that it's frosting-like. I can't really imagine why it would be separating, though. Did you end up getting it to work?